Marc-Andre Fleury is an enigma. His incredible amount of talent seemingly comes with the confidence of the Cowardly Lion. He is known for making the most breathtaking saves one will ever see only to then let in a goal that former Pens coach Michel Therrien could only describe as "soff." At 28 years old, Fleury is entering his prime as a player. He has 9 seasons of NHL experience under his belt, so his track record is long enough to make judgments. The questions is: Which way do you lean? Is Fleury a true franchise goaltender or a middling net-minder who costs far more than he is worth? He has been very good during the regular season, winning 23 games while losing only 8 this past season, with a .916 SV% and a 2.39 GAA. He holds a career .910 SV% and a 2.66 GAA, which is respectable. He is a twice 40-game winner and was on pace for 46 wins this past season, had there been no lockout, which would have been a career best. He is known for those highlight saves, ones that include a flexibility that appears to be impossible for a human. In 2011, he was an All-Star and was named the team's MVP. He was also a member of the 2010 Olympic gold medal team, though he did not play (Martin Brodeur and Roberto Luongo split those duties). On the other hand, he has been very bad during the playoffs, going 2-2 with a .883 SV% and a 3.52 GAA this year. Last season, against the Philadelphia Flyers, he was even worse, allowing 26 goals in 6 games. His GAA in that series was an ASTRONOMICAL 4.63. He has not posted a winning record in the playoffs the last 3 seasons, nor has he had a GAA better than .899. He remains terrible at handling the puck, a facet of his game he has improved only a little, if at all, during his career. Fleury will make $5 million a year over the next 2 years. That puts him in the same range as Jimmy Howard of the Detroit Red Wings and Jonas Hiller of the Anaheim Ducks. Is he worth it? Fleury was asked if coaches still have confidence in him. "Ask them," he said. So, you either have Bylsma talking up Fleury in an effort to raise his trade value, or talking him up to restore confidence to the Pens once and future net-minder. I'm betting the latter, if simply for who would remain to mind the crease if he were gone. 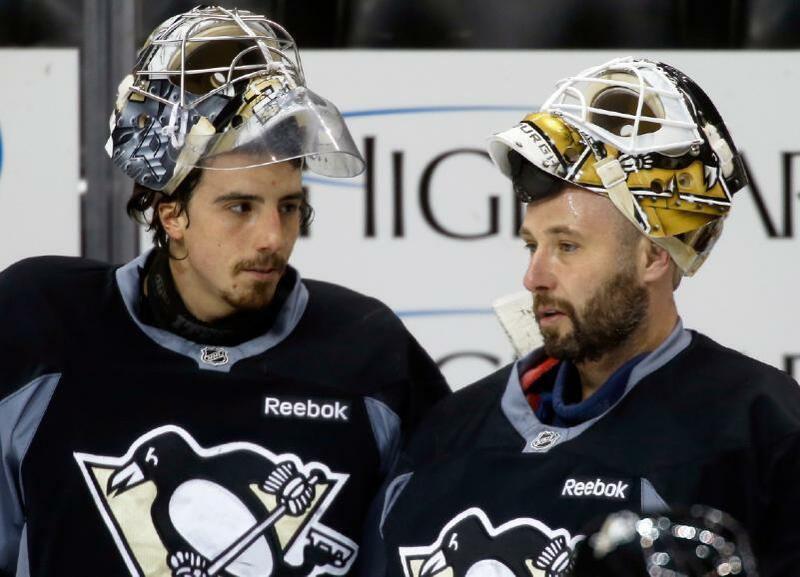 The choice many seem to be clamoring for is current backup, but playoff hero, Tomas Vokoun. 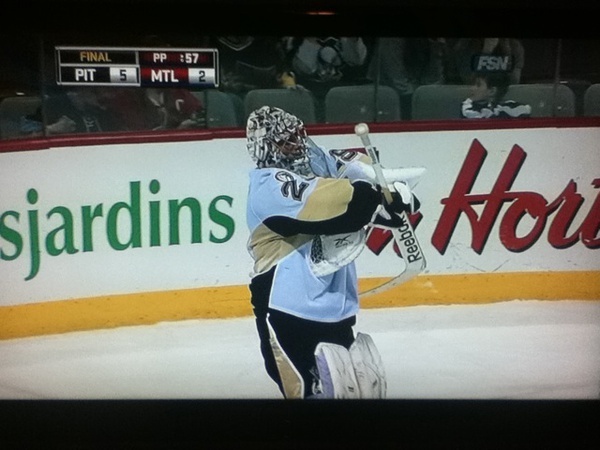 Vokoun was indeed a stabilizing force behind Fleury this year. A former No. 1 goaltender himself, he was able to fill the void left by the downfall of Brent Johnson the year before. He is a quality net-minder, but at the age of 36 (turning 37 July 2nd), he is in no way the future of the franchise. He has one more year remaining on his contract, and will earn $2 million for his services. He can no longer take the ice game in and game out as a No. 1 goalie, as the wear and tear would destroy him. At best, he is a stop-gap option until a new No. 1 goaltender is acquired/developed. Speaking of development, next in the organizational depth chart is Wilkes-Barre Scranton Penguins goalie, Brad Thiessen. At 27 years old, he is but one year younger than Fleury. He is untested, having played only 5 games in the NHL, posting a 3.72 GAA and a .858 SV%. Those aren't exactly numbers of hope. Add the fact that Thiessen is an unrestricted free agent and there is no telling what will happen with him. If Thiessen isn't in the Pens future plans, the 26 year old Jeff Zatkoff could be. In 46 WBS games last year, he posted a 1.93 GAA and a .920 SV%. He has no NHL experience, but has one year remaining on his current contract, with an NHL cap hit of only $550,000, after which he'll be an unrestricted free agent as well. A great value, if totally untested. My guess is he remains playing goal in Wilkes-Barre for now. Then there is the 24 year old rookie, Eric Hartzell. Hartzell only signed a one year contract, so he is currently a restricted free agent. He has no experience in the AHL or NHL, but he has quite the resume from the NCAA. He was a Hobey Baker finalist, given to the top NCAA Men's Hockey player. Hartzell posted a 30-7-5 record with a 1.57 GAA and a .933 SV% last season at Quinnipiac University. He took his team to their first ever Nation Championship series, sadly losing in the end. Hartzell could have a bright future with the Pens, but at this point, all he has is potential. Some grooming time in the AHL is in order. It seems that nobody currently in the system can challenge Fleury for the No. 1 spot. Barring trading for a goaltender, which is something I would never underestimate GM Ray Shero in doing, let's look at who is a free agent this off-season. Names like 37 year old Evgeni Nabokov, 35 year old Niklas Backstrom, 31 year old Mike Smith and 30 year old Ray Emery are the only UFA goaltenders with any type of real experience last season. Not exactly the cream of the crop, and it's quite possible that some are re-signed by their former teams. All this leaves only two real choices for the Penguins: Keep Fleury as the No. 1 goaltender or trade him (or some other player) for a quality goaltender coming in return. It all comes down to what the Pens see when they sit in judgment over Fleury. I, for one, think Fleury will remain a Penguin because he is a quality goaltender that has had some terrible defensive play in front of him during the playoffs. He wins lots of regular season games and can steal a game from time to time. He is also the only current viable option. Besides, who in the locker room or in the stands wouldn't miss the guy? What do you think the Pens will do?